And that is it. Those are the only substantive changes that have been made since the proposed final draft that I have managed to find. and I am not feeling sufficiently Samuel Beckett like for that kind of thing at the moment. All the other issues I have raised are apparently not really issues after all, or they are still there. I guess we’ll just have to wait and see. Copyright (c) 2009 By Simon Lewis. All Rights Reserved. This addition is presumably motivated by the fact that currently the vast majority of auxiliary MIDP compliant JME JSRs have not been updated to define fine-grained permissions for use with MIDP 3.0. Can a MIDP 3.0 MIDlet Suite use only the legacy attributes ? Can a MIDP 3.0 MIDlet Suite use named permissions to request fine-grained permissions ? For MIDP 3.0 applications, calling checkPermission throws an exception. The section entitled Security for MIDP 2.x MIDlet Suites, which is now only available as Section 9.2.2 of the PDF version of the documentation has not been changed. If there exists one or more instances of the MIDlet-Permission-<n> or MIDlet-Permission-Opt-<n> attribute in the JAD or JAR Manifest, then the Permission classes associated with these attribute values MUST be used, and any instances of MIDlet-Permissions or MIDlet-Permissions-Opt MUST be ignored. MIDlet-Permissions — attribute contains a list of one or more permissions. Multiple permissions are separated by a comma (Unicode U+002C). Leading and trailing whitespace (Unicode U+0020) and tabs (Unicode U+0009) are ignored. The permissions are critical to the function of the MIDlet suite and it will not operate correctly without them. MIDlet-Permissions-Opt — attribute contains a list of one or more permissions. Multiple permissions are separated by a comma (Unicode U+002C). Leading and trailing whitespace (Unicode U+0020) and tabs (Unicode U+0009) are ignored. The permissions are not critical to the function of the MIDlet suite and it will operate correctly without them. Given that an implementation now has to support a hybrid fine-grained/named permission model for MIDP 3.0 MIDlet Suites it is unclear why it cannot support it for MIDP 2.x MIDlet Suites as well. Either that or not allow them to use the MIDP 3.0 permissions in the first place. Removing the NotificationListener via the Notification.setListener(NotificationListener) method no longer removes the Notification as well. This eliminates the inconsistency between its behaviour and the documentation describing the Notification life-cycle which I noted in the original post. The other minor issues noted in my original post still exist. Scope of the Font created is now limited to the MIDlet that created it. Implementations MUST insure that the availability and use of fonts created using createFont method is limited to the execution environment of a [sic] MIDlet that instantiated the font. Documentation for all three methods has been updated to explicitly specify that the constant STYLE_UNDERLINED is supported in their respective style arguments. The specification of the static method Font.getStyle(String) however, has not been updated to match. Possibly it does not need to be. Who knows ? Font now has a hashCode, which of course it should since it over-rides the equals method. None apart from the secret hash code algorithm and that only affects implementors. of the Display class documentation. Displayable.getCommand(int) or Displayable.getMenu(int) will return null for every placement. The specification does not contain an explicit definition of the state of a Display’s placements when the onLayout(Displayable)[sic] method is called, that is, whether Commands and/or Menus previously placed on the current Display by the Displayable are still present or whether all Commands and/or Menus must be explicitly placed each time the method is called. This makes implementing the method perhaps more interesting than it ought to be. Well now it does. Every time you layout a Displayable’s Commands you start with a clean slate. possibly because it is actually not possible for a placement not to support Commands. The CommandLayoutPolicy now looks like this. Actually it doesn’t because I have re-formatted it. In Chrome, Firefox and Safari the formatting is all over the place, as it is in the PDF version. // sort the commands in the correct order depending on the positions available. // placement for each Command. This is an improvement on the previous version which was flat-out broken. Note that it still doesn’t check the return value of the call to Display.getExactPlacementPositions(int). The changes above are the only ones that I have found. Of the original issues I raised they address two if you are being charitable. Can there be placements which do not support Commands ? Probably not. Everything else is still up for grabs. Developers, assuming there are going to be any, are going to have to try it and see what happens, and then hope it happens the same way everywhere, which is the past has not been a guaranteed recipe for success. Possibly if somebody had attempted to write a real-world example for the specification the Command layout feature itself would have been better specified. The example provided effectively does no more than provide the existing default behaviour. The semantics of the depth returned by the method Menu.getMenuDepth() have been changed. Returns this menu’s depth within its menu tree. The top menu is of depth 0, the menus attached to it are of depth 1, 2, etc. The top menu is the menu in the menu tree that has no parent menu . If a menu is attached to both a Displayable and another menu, its depth is calculated based on the menu to which it is attached. For instance, a menu A is a sub-menu of menu B and is also attached to a Displayable. If menu B is of depth 3, then menu A will return a depth of 4. Previously, as I observed in my original post, the specification was both contradictory, and seemed to imply, amongst other things, that a Menu could effectively have two depths. Although it is not a particularly serious issue, despite the changes, it is not exactly clear what having the ability to obtain the depth of a given Menu is actually for. The depth of a Menu is only significant in the context of the maximum limit on Menu depth. If you know that a Menu is at the maximum permitted depth then it is true that you know that you definitely cannot add a sub-Menu to it. If you know that a Menu is not at the maximum permitted depth however, you do not know that you can add a given Menu as a sub-Menu with out knowing whether the Menu you wish to attach itself has any sub-Menus, and if so what the maximum depth of the sub-Menu tree, and you are going to have to compute that. As I say it is not serious but some use-cases might have helped. This is also true of the eternally enigmatic Menu.onParentEnabled(true). What is it for ? Technically this is not a case of redux as I have not written about it here before although I did comment upon it in the public review. In the proposed final draft Appendix A – Application Attributes looked, in part, this is not all of it, like this. This is actually the start of the HTML version. 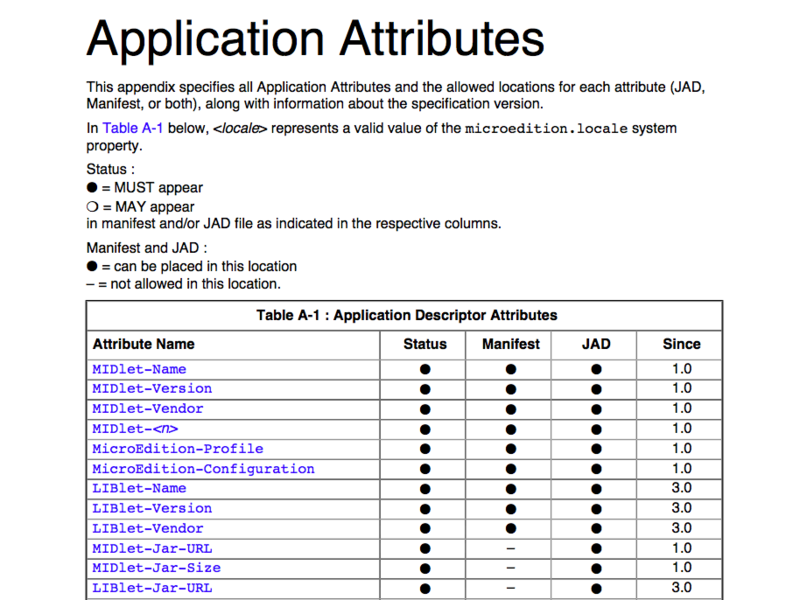 This appendix specifies all Application Attributes and the allowed locations for each attribute (JAD, Manifest, or both), along with information about the specification version. In Table A-1 below, <locale> represents a valid value of the microedition.locale system property. in manifest and/or JAD file as indicated in the respective columns. – = not allowed in this location. Appendix A now only appears in the PDF version of the documentation, and it looks like this. The only visible difference in this part being a minor difference in the wording in the key, but in fact a number of attributes that were marked as not being allowed in the JAD in the proposed final draft are now allowed there. I have no idea what the motivation for this change was. Although this is not the major issue here it is also worth noting that a number of the sections which previously appeared as both HTML and in the PDF in the proposed final draft, are now present only in the PDF, with the result that the remaining HTML documentation now features a number of broken links. See the javax.microedition.midlet package documentation for a particularly fine selection. As I argued in my comments in the public review, the table in the form it was then, and still is, is remarkably unhelpful. That is it mandatory is apparent from the table. That it MUST appear in both the JAD and the Manifest simply is not. but the entry for it in the table is identical to that of the MIDlet-Name attribute. In short the table cannot be used for anything very much in the absence of the text which describes the constraints on the individual attributes which the table does not link to. I put forward versions of the following as being a possible alternative approach. These have been updated to reflect the current status of the various attributes as I currently understand them. Although the tables are a bit verbose in this form they can at least be used standalone. No changes, so the MIDlet lifecycle diagram remains, and there really is no positive way to put this, utter and total gibberish. No change in the specification, so javax.microedition.midlet.MIDletIdentity still isn’t. and on the basis of the specification alone it is effectively impossible to tell which. For added obfuscation the PDF version of the documentation omits the class description altogether. As I said originally, this would have been incredibly easy to fix, why wasn’t it ? No changes in the specification means no changes in the issues. 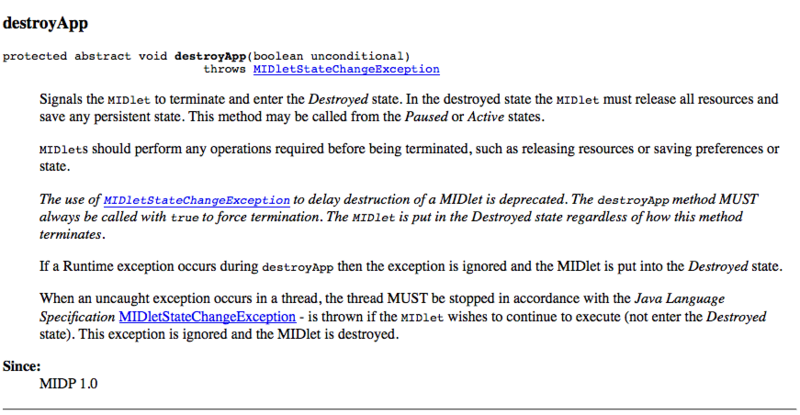 The HTML version of the documentation for the method MIDlet.destroyApp(boolean) still looks like this. and the PDF version still looks like this.